More than a dozen members of Cicero Youth Project rallied outside the Daley Plaza center on May 12th to bring awareness to the public that youth violence prevention programs are suffering cuts due to ‘political disputes.’ Cicero Youth Project along with other organizations attended to show their support. 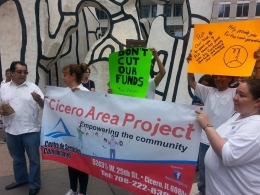 Cicero Area Project was founded in 2008 by a group of Latino residents concerned about community conditions affecting the growing Latino families in the area. Cicero Youth Project focuses on tutoring, youth leadership, social services, and youth work.